If exceptional loft is what you’re after you’ll love our fluffiest comforter with its patented design available only from Pacific Coast®. Meticulous pleating in the corners of each box creates more space so the white goose down can reaches its maximum, most sumptuous loft. This is by far the best comforter I've ever used. I've had it for several months now and it still retains its loft. It's terribly comfortable and quite stylish. Your dreams will be sweet under our fluffiest, most inviting Deluxe SuperLoft™ Year Round Comforter. 600 fill power of Hyperclean® white goose down has ample room to reach its maximum loft thanks to the meticulous corner pleating and extra fabric in the tufted baffle box design. The navy blue corded, 500 thread count cover in 100% cotton will pamper your skin with its soft feel while you settle in for a great night’s sleep. 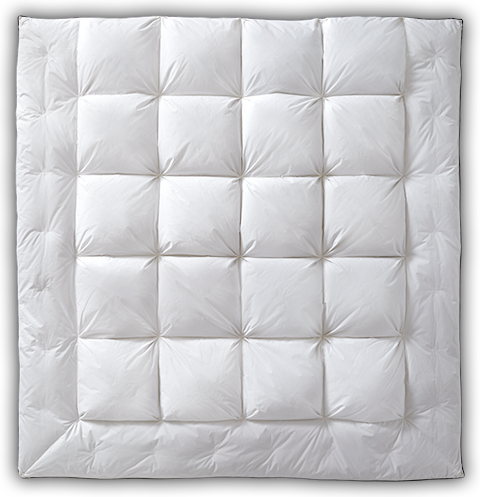 All year round, the three dimensional tufted baffle box construction of this oversized comforter together with our Comfort Lock® no-shift border will provide you with supreme loft that stays over your body instead of migrating to the edges. Convenient duvet loops complete our Deluxe SuperLoft™ Year Round Comforter with a design so unique, its patented and only available here at Pacific Coast® . When used in comforters, down allows air to circulate around you contributing to a comfortable environment and deep, sound sleep. When used in pillows, down provides soft adjustable comfort that conforms to your changing sleep positions. Pacific Coast® white goose down is carefully sorted and selected to ensure that only the fluffiest clusters are used. Meticulous pleating in the corners of each SuperLoft™ box creates extra space for our down fill to expand to its very fullest. Considered our fluffiest comforter and blanket style, this patented design results in a sumptuous loft and appealing tufted look across the entire comforter or blanket.